That's the way to start out the biggest MMA event in North American history. Pablo Garza flashed some impressive jiu-jitsu by executing a flying triangle. Garza caught Yves Jabouin in the submission and finished it on the ground to up his first UFC victory at 4:31 of the first round. John Makdessi followed that up with an even more spectacular spinning backfist knockout of Kyle Watson. Watson caught the left hand on the chin, went down in a heap and slammed his head against the mat at 1:27 of the third round. 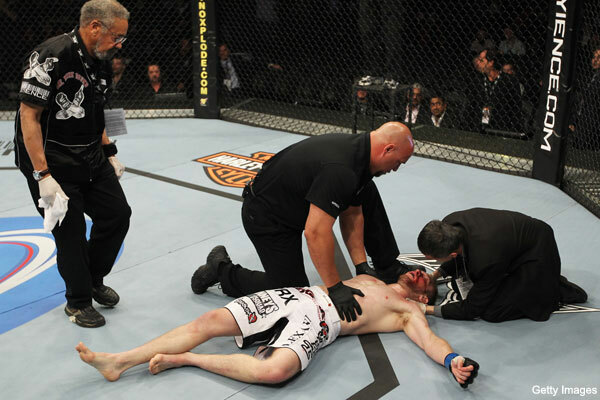 He was actually unconscious for a few minutes following the knockout. UFC 129 sold 55,000 tickets at Rogers Centre in Toronto. Media members on the scene report that the building is about half full with another five and half hours of fighting on the way. Garza-Jabouin and Watson-Makdessi were the first two of five fights being streamed on the UFC Facebook page. There's a long way to go, but Garza and Makdessi certainly themselves in the mix for a postfight bonus. The UFC hands out bonuses for Knockout of the Night, Fight of the Night and Submission of the Night. The promotion awarded record $100,000 bonuses at UFC 100. With a UFC-record gate in excess of $11 million, one can only guess how massive tonight's bonuses might be. UPDATE: UFC analyst Joe Rogan confirmed the bonuses will be $129,000 each. You can watch UFC 129 on PPV (9 p.m. ET/6 p.m. PT) right here on Yahoo! Sports.